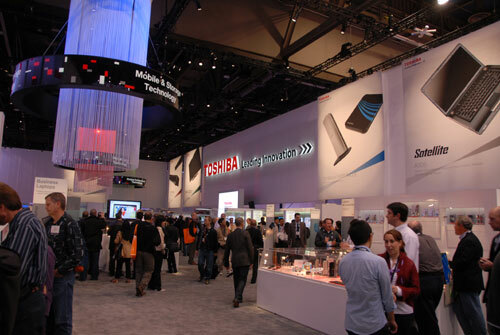 [CES 2009] Toshiba Booth Highlights | OhGizmo! 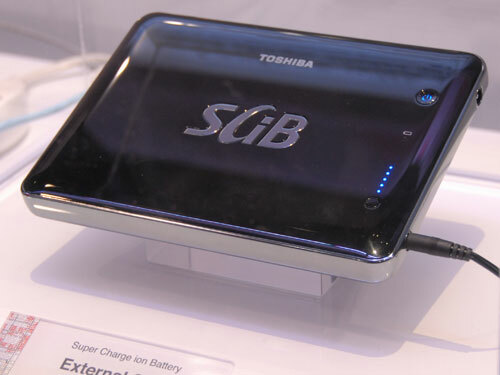 Here’s the coolest stuff from the Toshiba booth at CES. There’s plenty more cool stuff after the jump, and I’ve saved the best (IMO) for last. Now this is a pico projector. 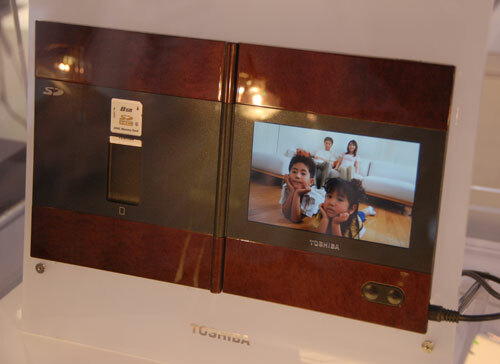 It’s a prototype (can’t tell if it was functional or not), but Toshiba is shooting for 2010 in this form factor. Toshiba media server. 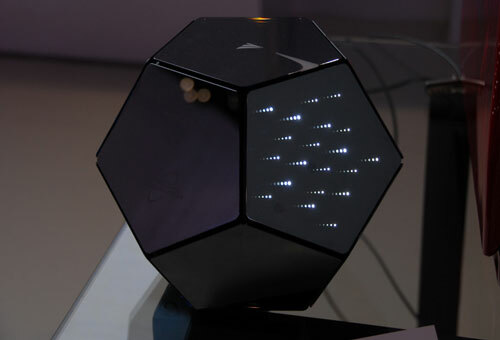 It’s a prototype and it may not even be functional, but it’s got cool LEDs and it’s a dodecahedron! Lots more, click on through. 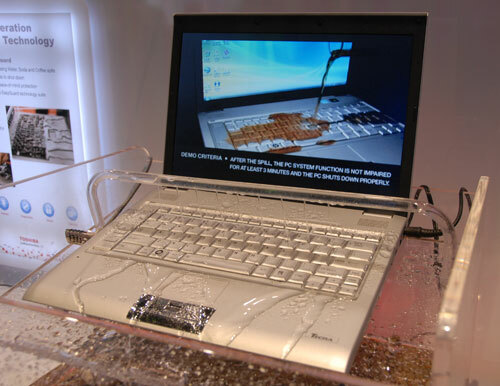 Spill resistant sealed keyboard. The demo says 3 minutes, but the rep said that the water had been on for 6 hours. Available now in Toshiba business notebooks. 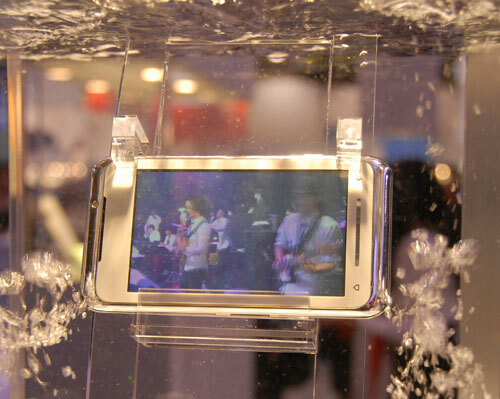 Water resistant internet viewer. Looks pretty close to waterproof, to me. Great for showing movies to your fish. Prototype. SCiB external battery pack. We had a look at these back in October; they charge to 90% capacity in 10 minutes and are good for 5,000 cycles. You’ll be able to get adapters to power your laptop from this. Should launch in December of this year along with the SCiB laptop batts. SD photo album. Kinda a neat idea, and it’s got a nice look, even if the screen is a bit small. Rep said there had been a lot of interest, but there are currently no plans for production. Leaning LCD TV. You don’t need a stand or a mount, it just leans against the wall. 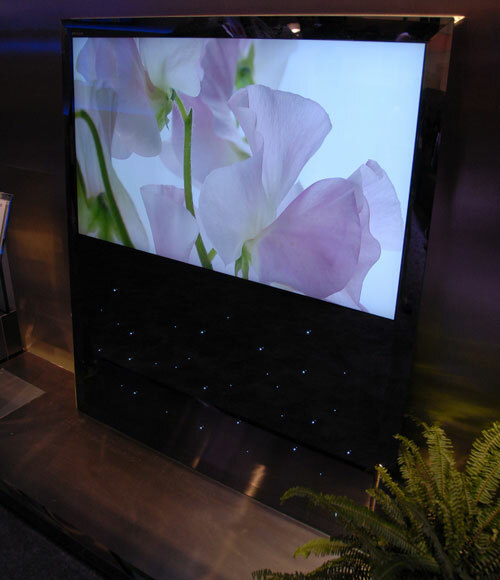 It’s also a pretty nice TV, with a mirrored glass bezel with LEDs underneath and an integrated DVR with a totally unnecessary but awesome 256 gig SSD. Prototype internet viewer. It’s powered by an integrated methanol fuel cell good for one week of normal use. 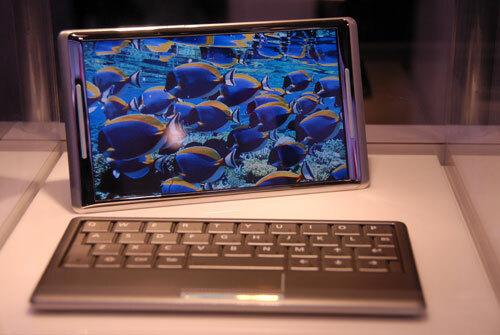 It comes in 7″ or 4″ and the keyboard is somehow wirelessly connected to the screen, but the screen is also a touchpad so the keyboard is optional based on what you need to do. Note that this thing is completely functional, and the Toshiba rep told me that it’s due out in December 2009. I don’t believe it (it was a PR rep, not an engineer), but that’s what they told me. Fingers crossed.